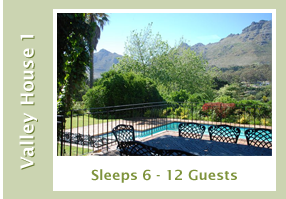 The King's Place is a small holding set on 8 acres of prime agricultural land in the lush seaside valley of Hout Bay, Cape Town. 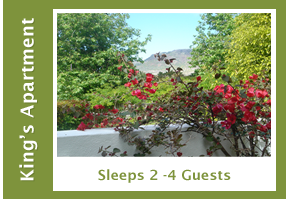 We are surrounded by magnificent gardens with views of the back of Table Mountain, the Constantiaberg and the renowned Chapman's Peak. We are 5 minutes from the beautiful white sandy beach of Hout Bay, 10 minutes from the Constantia Wine Route and 20 minutes from Cape Town central, Table Mountain Cable Station and The V & A Waterfront. The King's Place is a working farm. Ian King, my husband, is a horticulturalist who prides himself in growing a selection of clivia's, bromeliads, palms etc. in green houses and in the fields. We also have a small free range chicken farm with about 100 chickens and a growing number of Chinese geese. (We only sell the eggs!) There are beautiful equestrian facilities where stables are fit for a King. We stable up to 10 horses. Ian's latest attraction to our "farm" is a Kio pond. 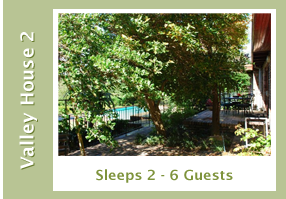 The King's Place can accommodate up to 26 guests. 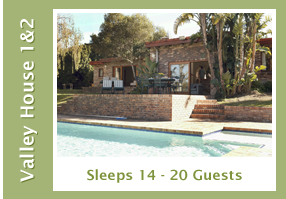 It is the perfect venue for a couple wanting to steal away, a family reunion, a small conference or business group or simply a family getaway. 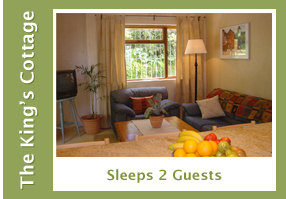 All accommodation at The King's Place is self-catering. It is a luxurious country experience enhanced by carefully selected furnishings and fabrics. Each place has its own entrance and private BBQ area. There are 2 large swimming pools and for the energetic, there is a tennis court.